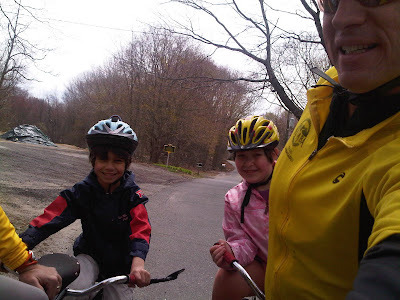 For Day 22 of the 30 Days of Biking Challenge Katie and I had planned to do a Tandem Ride on The Housatonic Rail Trail form Trumbull to Newtown and I as I was getting the Burley ready to roll, my team mate Fabian sent me a message asking where was I riding today. Told him noon at Trumbull. 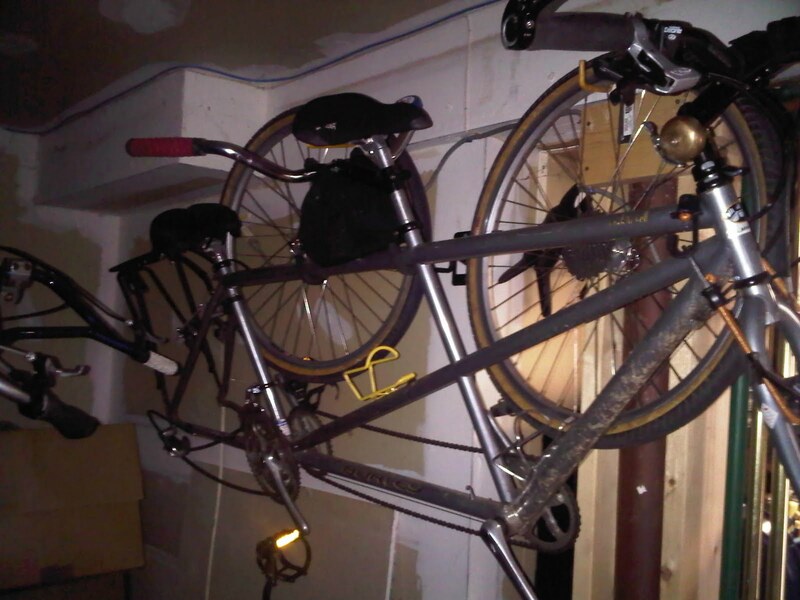 Like me, he has three kids a little older than mine so he had to find a stoker, because like me he also has a tandem. One of his kids said he would go and he FB'd me saying he was a go! Riding the tandem felt really good on the legs. I had wanted to get more trail miles in this week but a combination of busy schedule and kids activities prevented that. 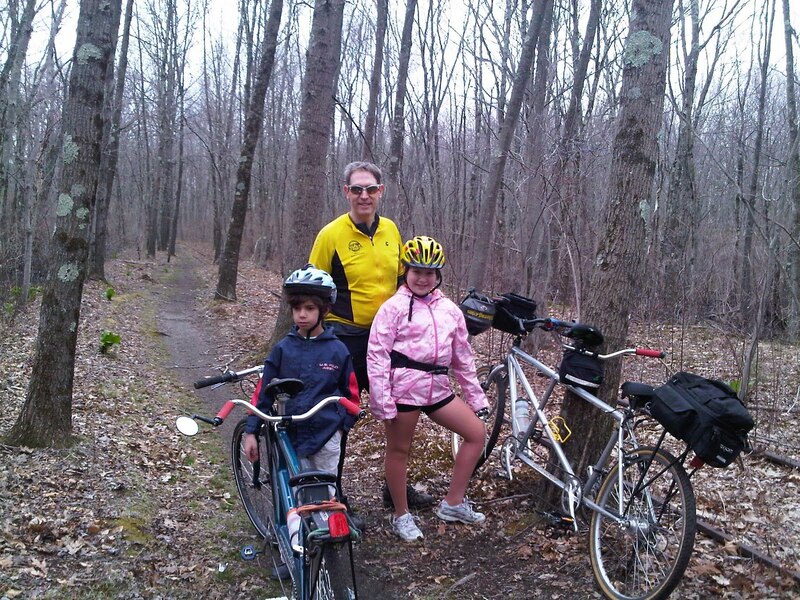 This was our first practice ride for the Blumin Metric, a 20 mile round tripper on the rail trail. We have to step it up if we are going to do 40 mile but we just need to ride some Newtown roads to get in shape for that. The paved section between the Monroe line and Whitney Avenue is always fun, especially riding under Rt 25 but I hate the blind curve as you come down the trail and hook under the bridge. The nice thing about riding on Good Friday is that there were barely any people out on the trail. I put Katie in a rain coat and made sure she had some leggings because when it was sunny out, the temperature was nice but still a bit cool. However, when the sun went away it got down right raw and the wind of course didn't help. A little disheartening to find this tree still blocking the rail trail after two weeks and reporting it to Parks and Rec.. I am going to give the town one more chance and if they can't get it done, then I am going in with my official CT NEMBA Trail Ambassador Saw and taking care of business myself. We stopped at the turn-around for a little snack and water and of course to pose for some pictures. And then it was back down the trail to Trumbull. I reversed the camera to capture what was going on with my Stoker. She definitely shines for the audience. It was all down hill from there. Finally, I found an app that accurately displays the smooth display of the Rail Trail Profile using Ride With GPS.com. We rode a total of 19.8 miles. You can get 20+ if you ride past the turn around but technically that's property that is part of an EPA Superfund Cleanup Brown Site, that will probably never get cleaned up. Too bad because it's a really nice trail up to Swamp Road. 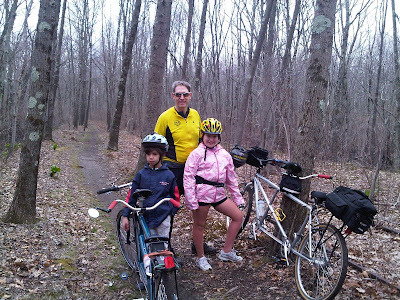 What would be really, really nice is if the "Rail Trail" occupied one side of the road bed with the rail road tracks and then you could ride from Trumbull to White Plains without ever riding on a road! Add the Norwalk River Trail to that and you could get a mind boggling network of greenways and rail trails for cycling. Once back home, I figured out a new way to store the tandem in the garage. If I loosened the seatpost and spin the stoker bars it would be flatter against the wall. 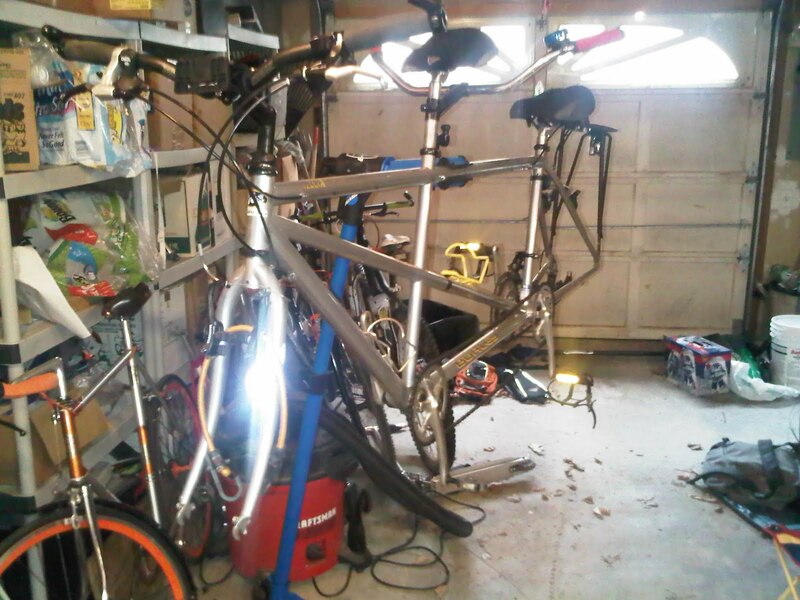 After doing this I counted 14 bikes in my garage which included two fixed gear commuters, 4 mountain bikes, my wife's comfort bike, 5 kids bikes, and two Trail-a-bikes! Sounds like a great pre race warmup with your daughter. Cool new blog pic of the Dissent post-massasoit.